Click here to download the stencils! STEP 1 The first thing to do is to prepare the stencil. Just print your stencil out on paper and then cut out the center of the image. 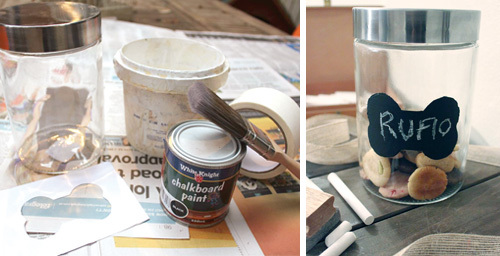 STEP 2 Once you have the stencil ready, stick it to your jar by applying masking tape to the outside edge. STEP 3 Apply the paint carefully within the open area; about three layers of the paint should suffice. After the paint dries, carefully take the stencil off. If there are some imperfections in the shape, don’t worry; it can be easily scratched off. Or leave the edges a little rough for a more rustic look. STEP 4 Then label the jar with chalk, fill with delicious organic dog biscuits, and proudly set it out on your kitchen counter! DIY by Naomi Davis of Treats à la Bark, an Australian organic dog biscuit company making handmade, human grade, certified organic treats made with a low allergy-risk formula (no dairy, no wheat, no preservatives, no chemicals, no soy, nothing artificial, no nasties!). And they support and champion rescue! Check out how cute Naomi and her Pug are.